How can I quit vaping? Vaping has nowadays become a trend over smoking cigarettes. This habit of vaping can be an expensive habit and vaping health risks are increasing day by day. You need to understand the risks associated with vaping and immediately quit vaping. Many people opt-in for vaping just because it is fun and the smoke which is being generated by the e-cigarettes is much more than normal cigarettes. The liquid which is being used in e-cigarettes contains nicotine and this nicotine will get you addicted to vaping. Vaping is using electronic cigarettes which are commonly known as e-cigarettes. The vaping device contains a liquid which is being used to generate smoke. The pen-shaped device holds the liquid inside and batteries are being used to heat the liquid to generate smoke. The liquid consist of nicotine, flavors and added chemicals. Users can generate smoke when they puff the e-cigarettes, when users take a puff, the heating element is activated and generates smoke which users then inhale. The liquid which has higher nicotine levels than normal cigarettes are obviously more associated with vaping health risks and the liquid which has low nicotine levels than normal cigarettes are less harmful. If you are choosing to vape over smoking than be wise to choose low nicotine level liquids for vaping. However, smoking or vaping will be harmful to you in a long run. Lets first understand vaping health risks and later in this article we will show you the ways in which you can quit vaping. Here we will try to answer all your questions regarding vaping health risks and provide you with useful information. 1. Can you get Lung Cancer from Vaping? Yes, vaping is associated with cancer and know as one of the vaping health risks, there is a possibility of you getting lung cancer if you are vaping. Many chemicals which cause cancer are present in the liquid which is being used for vaping. Chemicals like formaldehyde, heavy metals and other chemical particles. Some of these chemicals are proven to be a human carcinogen according to the toxicology data available. It is hard to know how many levels of these chemicals can lead to cancer. serious lung disease called Bronchiolitis obliterans. Commonly know as popcorn lungs. 2. What is Popcorn Lungs from Vaping? Popcorn lung disease is on top of the vaping health risks list it is a nickname for Bronchiolitis obliterans. This disease is related to damage of the small airways of your lungs which carry oxygen to all over your body from lungs. When you suffer from popcorn lungs you will fell short of breath and more of a cough. These airways are like branches of the tree which carry oxygen and these are affected and damaged by vaping. Vaping can cause serious damage to such airways. 3. Can Vaping Cause Respiratory Problems? Yes, Major vaping health risks problems are associated with respiratory problems, vaping can cause respiratory problems. There is also a case study on the respiratory problems of vaping. Do read it if you want more information. This case study shows that many people were facing problems like shortness of breath, more cough, inflammation of the respiratory system due to vaping. Vaping health risks list also consist of problems like gastrointestinal conditions, heart problems, nicotine poisoning and injury caused by e-cigarette battery explosions. 4. Does Vaping Harm Blood Vessels? There is a case study where the heart institute has used 9 to 10 vaping liquid to test if that liquid is proven to be harmful to blood vessels or no. Yes, vaping harms blood vessels and it should be considered one of the vaping health risks. The study showed that this liquid effected and caused danger to endothelial cells. These cells were exposed to vape liquid and some cells died after the exposure and some cells inflammation when exposed to vape liquid. It is also proved that flavored liquid caused more damages to the cells. 5. Can Vaping Cause Mood Swings and Change in Behavior? Yes, it can lead you to a drastically mood swing nature and might affect your behavior too. There was a survey conducted by the National Youth Risk Behavior team and it showed that people who are vaping are associated with risky behaviors. Drastic mood swings, anger, no patience, injury, violence, and sexual activity are some sign of vaping health risks which were more in people who are into vaping. Now when you have understood many different vaping health risks. Below are some of the best ways to quit vaping. You need to be very calm and set up your mind for problems to arise when you start to quit vaping. Only quit vaping if you are ready to face the challenges. Once you start the process to quit vaping you have to be firm on your decision and treat it as a goal of your life. 1. Identify Vaping Trigger Point. Write down when and where you get the trigger to vape. So that it will be easy to plan out and will give you a way to stop the triggers. Like some people have a habit of vaping after eating something, so stop the trigger by going for an instant walk after eating. Some people have a habit of vaping while driving, so stop the trigger and put a chewing gum while you drive or listen to good music or talk to some of your friends while driving or just carpool. This will help you to avoid vaping. Many people vape just because they are bored and have free time to pass, stop this kind of trigger by going for a new activity or just get a new hobby or join some class to learn something new. 2. Get Doctor's Help to Quit Vaping. Getting doctors to help you to quit vaping is a good idea and doctor will help you to make a proper quit plan according to your lifestyle. Doctors might also help you with some medications if you are facing symptoms of vaping health risks and also which won't trigger you to vape. Dealing with Nicotine withdrawal from the body is not an easy task. Nicotine withdrawal has many side effects also, it is better if you get doctors to help which might help you in the withdrawal phase. 3. Create a Plan to Quit Vaping. Here you must list down all the reasons why you choose to quit vaping. This will help you to get inspired when you get the trigger for vaping. 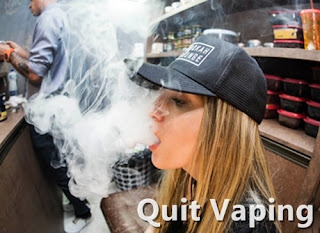 Just remember vaping health risks problems and the reasons you choose to quit when you get the trigger to vape, this will act as a motivational plan for quitting vaping. Vaping will also help you to save money which you can invest to make your life better and stable. This money can also help you to do the things which you are interested in or achieve the goals of your travel. Take the control back of your life by quitting vaping and do not let nicotine rule your life. Quit vaping for your family and remember your bond with them when you get the triggers to vape. If you are a parent remember your kids when you get triggers to vape. Remember the person you love the most and think about vaping health risks problems which can land you in the hospital, this will help you to stop the triggers of vaping. 4. Quit Vaping Slowly in a Month. Many people will just instantly leave vaping in a day. That is good if you are ready for complicated and intense behavior changes and you are strong enough to deal with intense situations for a month. But I personally suggest a one month quit vaping plan. Which includes the slow process of quitting. Make a one month plan and reduce vaping slowly and gradually and end it after a month. Suppose if you vape 3 times a day, then you make it 2 times and then 1 time and then you leave. 5. Reduce Nicotine Level in Your Liquid. If you chose to stop vaping slowly and gradually, you need to get a nicotine plan. Nicotine plan is making a schedule for a month by reducing the nicotine level in the liquid. Suppose if you are vaping with a liquid of 24mg cut down to 16 mg the next week, then cut down to 11 mg the next week, then cut down to 8mg slowly and finally at the month end trash your e-cigarettes. 6. Stay Busy When you Get the Triggers to Vape. When you get the trigger to vape just start doing some other activity which you like and keep your hand and mind busy. If you are at home and you get the triggers to vape, go and help your family members in some work they have to complete, or just play some game or watch a movie etc. You can also use a stress ball if you get the trigger to vape when you are out or at some social events. How to Deal with Nicotine Withdrawal Symptoms. When you stop vaping the nicotine level in your body will reduce and you might face the nicotine withdrawal symptoms. Some of the withdrawal symptoms listed in vaping health risks list are:- Sweating, headaches, nausea, sore throat, anxiety, depression, weight gain, an intense craving to vape, tingling in hand, irritable mood, trouble sleeping etc. You have to be strong and deal with all these vaping health risks symptoms for just 1 month. As all these symptoms will end in a month and your control for just 1 month will get you great benefits in life. 1. Drink a Lot of Water if you Face Nicotine Withdrawal Symptoms. Drinking water will keep you hydrated all the time and you won't get a dry mouth or a sore throat. Water and fresh juice will make you feel good from inside and you will feel very fresh when you consume a lot of water. 2. Use Chewing Gum When you get the Craving for Vape. Chewing gum will distract your brain from the craving of vaping. Opt-in for sugar-free chewing gums which helps you to quit vaping. If you do not like chewing gums go for raw vegetables or fruits like apple, carrots, celery etc. Just keep your mouth busy with anything you like when you start to crave. 3. Get some Exercise when you Face Nicotine Withdrawal Symptoms. When you get the craving it is better to instantly go for a walk or get some quick exercise. Sweat out in the gym or free run in the park. It will change your focus from craving for a vape to making your health better. It is also advisable to make a daily routine of exercise, it will make you more fit and healthy in life. 4. Go to a Public Place where you Can't Smoke. When you get the craving to vape just roam around in some public places where you can't smoke. This will be helpful to quit vaping. Go for shopping in a mall or just grab some salad in the food court of the mall and sit to eat. It is also nice to join some public group for social activities happening around in your area. 5. Sleep More for a Month. Nicotine withdrawal one of the vaping health risks problems will make you feel low of energy or sleepy, Do not worry and go to bed early for a month. Nicotine has helped you to stay awake and alert all the time but when you withdraw nicotine you might feel tired. 6. Ask for Support if you Face Nicotine Withdrawal Symptoms. It is a good way to deal with your mind and when you get additional support from a group or a helpline it will help you to quit vaping. In every country, there is a helpline which you can call on and talk with them regarding quit vaping or ask them for suggestions or just talk to them to keep yourself busy. These helplines are generally termed as smokers helpline. 7. Meditate and Reduce Stress. It is possible that you will face anxiety and your irritation will increase which will end up in putting you in stress. Do not feel stressed, because if you feel so, you will again start to vape and increase vaping health risks. There are many other ways to deal with stress. Find the ways you like. Avoid taking new responsibilities in your life until you have completely quit vaping. Just relax and find new ways to pamper yourself.